The Anthurium Enliven® range are an excellent indoor or shade plant with bright flowers that come in, red, white, pink or mauve. Its foliage is heart shaped and glossy green. 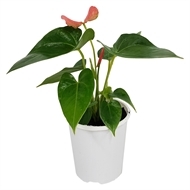 With regular water and a bright and humid situation this plant will thrive.